Sonoma County Fun Facts: Before jumping into the details, let’s look at some quick facts on the region. Made up of 12 “American Viticulture Areas” (AVAs). What’s an AVA, you ask? Well, upon an initial glance, I think we need a whole post just on this topic. But in summary, AVAs are wine regions based on geographical/climate differences. Sonoma’s American Viticulture Areas (AVAs): So let’s talk about these AVAs. Because Sonoma is so big, it has quite the landscape variety – mountains, valleys, rivers, plains, etc. And all of these climate differences change the way vines grow… and therefore, the make-up of the grapes… and ultimately, how the wine will taste. 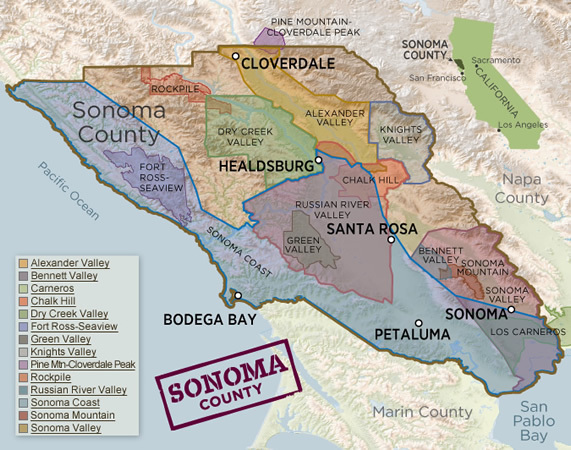 While Sonoma has 12 AVAs, there are four key regions. And those are the four regions that we’re going to discuss here. Why is this information important to know? Well, because we’re going to review what each region produces best…. so when you’re at the store wondering if you should get a Pinot or a Cab from say, Alexander Valley, you’ll know which is your best bet. That or you can impress the fellow shopper with your wine know about Sonoma. This area is located on the northern end of Sonoma County, and has a warm days, relative to the area, and cool nights due to coastal fogs. Because of the warm days, it best grows grapes that do better in warm climates, including Cabernet Sauvignons and Chardonnays. My favorite part of this post’s research are these words from the Oxford Encyclopedia of Wine: “Alexander Valley is noteworthy among other Sonoma county appellations for the fleshy voluptuousness of its wines.” Finally! I’ve been looking for a fleshy voluptuous wine!! The Wine Bible notes that Alexander Valley Cabs are “agreeable with notes of chocolate warmth”. Chardonnays from this area are more bold, full-bodied that Chardonnays from cooler climates. W2WK Note: Anyone who has been following this blog for a little while knows that W2WK is a fan of the Costco and Trader Joe’s wine selections… both have delightful self-labeled Cabernet Sauvignons from this region! The Russian River Valley is much cooler than the Alexander Valley as much of it is only 10 miles from the ocean. Naturally, this results in the production of more wines from grapes that grow best in cooler climates. This primarily includes Pinot Noir and Chardonnay. The Chardonnays from the Russian River Valley will be less full-bodied than those of Alexander Valley, but more well-balanced. Pinots from here will have a lovely richness and and complexity to them. Grapes from this region are also used for Sonoma sparkling wines. This region is one of the oldest in Sonoma, where one can see lots of old gnarled vines (indicative of old vines). The climate is warm during the day with night/morning fog. This leads to a balance between typical maritime and inland climates. The warm days result in the region being known for producing Zinfandels and Cabernets. “Some Dry Creek zinfandels are big and meaty; others, soft and graceful. What the rest of them share is a sensual richness of flavor that can be irresistible.” (The Wine Bible) As far as white wines go, look for Sauvignon Blancs from Dry Creek. W2WK Note: This blog has posted about a Ridge Zinfandel before. Check it out! Sonoma Valley has a variety of geography and climate as it sits at the foothills of the Mayacamas Mountans. This variability allows for a large variety of grapes to be grown in the region. This includes Cabernet Sauvignon, Zinfandels, Pinot Noirs, and Chardonnays. Wineries from Sonoma Valley to check out: Laurel Glen, Ravenswood, Hanzell, Kistler, Matanzas Creek. What are your favorite Sonoma wines? And which do you think you’ll run out to try? I think I’m going to dive into some Dry Creek Valley wines myself! 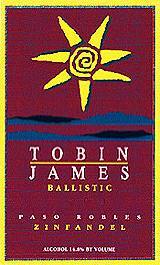 As previously noted, I fall easy for a bottle of wine with a good label… And the wines of Tobin James Winery do not disappoint. All of their bottles are brightly colored with their signature sun logo. When I visited their winery last November, they had little sun patches that they gave out with the tasting… and for some reason, that easy little marketing delighted me to no end. (I’d be the worst test case for marketing… would find any silly thing kinda fun.) But I digress. While I’m drawn to wines of any winery that I’ve visited, this winery is full of tasty wines at a nice variety of price ranges. Today’s post, however, is about their Zinfandel. Now, I have to admit, I have not often picked up Zinfandels. I’m not totally sure why, but I think it is because I had only had very fruity Zins. But my Paso Robles visit gave me a new (and improved!) perspective on Zinfandels and I’ve been enjoying a fine variety since! This wine had a big fruity flavor to start. I’d describe it as a peppery cherry kind of flavor… but instead of finishing off with that heavy fruit, it finished almost soft and smooth. It was like a little treat for the wine to finish off so smoothly after such boldness to start. So, clearly, I really enjoyed it! Anyway, the take-away here is that this Zinfandel is tasty and delicious… and very reasonably priced! As some of you saw in my recent blog announcement, I picked up a couple of new wine books recently and have really been enjoying them! So tonight, when spicy beef tacos were on the at-home dinner menu, I went to my trusty new book, Wine, Food, and Friends, to see what Karen MacNeil, the author, would pair with a spicy dish. One little tip in this book states that “dishes with bold, spicy, hot flavors are perfectly cut out for bold, spicy wines. This is one reason why many Tex-Mex dishes work so well with zinfandels…”. So basically, this sentence was why I pulled out the one Zin I had in my wine fridge to accompany my spicy beef tacos. And indeed, the peppery but smooth Zin was delightful with the spicy beef and sriracha sauce. So if you’re picking up a bottle of Zinfandel, it is likely to be a big, fruity wine… and therefore, should go well with your favorite tacos or burritos or other spicy delights. Hell, if you like sriracha like I do, you may just want to pour a little bit of that sauce in a dish and a glass of Zin and call it a night! Happy Sunday, Winos! May your week be peppery and fruity – seems like a nice balance for wine, and for life! Note: The Alamo Drafthouse is actually a movie theater. Their full title is the “Alamo Drafthouse Cinema”, and they celebrate a chosen movie each year via a special bottle/line of wine. This year, in honor of the 25th anniversary of The Princess Bride, the Alamo Drafthouse bottled The Bottle of Wits. And we Princess Bride fans, who are also Winos, will forever be grateful. Disclaimer: Normally, I do not read about the wines that I’ve selected for Divine Wine Sunday until after I’ve written my own assessment. Since I have been pretty darn excited about trying The Bottle of Wits (and because I had already blogged about it – though not as a “Divine Wine”), I felt it necessary to disclose that I did read the description of the bottle before writing my “Wino Assessment”. 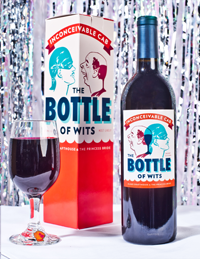 That said, did I enjoy The Bottle of Wits Inconceivable Cab? YES! And yes, you’re right. 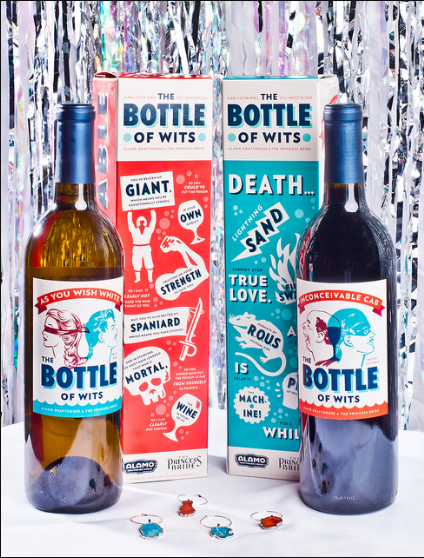 I was slightly swayed by the idea of The Bottle of Wits… and then when I saw the packaging, I was swayed even more. I thought, “there’s no way I won’t like this wine!” I mean the box itself has lots of PB quotes all over it. It indicates that the wine is “iocane free” … “most likely”. How could a PB fan not love that?! But ok – beyond the awesome packaging (both on the bottle and the box), the wine was very enjoyable! For me, it was an ideal combination of that Cabernet dryness and a smooth fruit flavored finish. The wine left your tongue a little chalky, but not so much that you needed a glass of water to accompany your glass of wine. I have posted on Cabernet Sauvignon here on Wino to Wine Know before. There is certainly more to say about this wine, but for the purpose of this post, I think it will serve it justice to reference the details of the grape from the previous Cab Sauvignon write-up. The Alamo Drafthouse Cinema included a nice description of their Inconceivable Cab. California Cabs are recognized and respected around the world and the state plants about as many of these grapes as the Bordeaux region does. Apparently, those crazy Californians from Stag’s Leap Winery beat out the Wine Know Frenchies back in 1973 in a blind tasting (funny because I just commented on this wine last week in the Wine Talk Leap Day post per CA Wino’s comment!). In the late 1980s, California’s vines were hit with phylloxera (vine disease) which forced many parts of the region to replant all together. But by the late 1980s, Cabernet Sauvignon grapes were replanted and in nearly twice the numbers they had been before the pesky vine disease. An interesting Cali Cab fun fact is that Cab grapes from Sonoma County have anise and black olive flavors, while Napa Valley Cab grapes tend to have black fruit flavors. In conclusion, I gotta say that I’m so glad this Inconceivable Cab is not only something I can and have now conceived, but also a wine that I truly enjoyed!! For the delight of the wine AND the fantastic packaging, I highly recommend ordering it if you’re a Princess Bride fan… or maybe you’ll be as lucky as me and have someone like the Karate Kid be kind enough to pick up a few bottles while visiting the Alamo Drafthouse in Austin, Texas. A few years back during a lovely dinner party, someone pulled out a bottle of La Crema Chardonnay. And I remember it distinctly – mostly because white wines do not usually make a memorable impression on me. Sure, I like white wines and drink them regularly. But for whatever reason, reds typically leave me wanting more than white wines do. However, I remember so clearly sitting around the dinner table with many good friends, and taking a sip of this Chardonnay and thinking, “wow – this is lovely.” Since then, I have enjoyed La Crema on multiple Chardonnay occasions… but it’s time to Wine Know a little more about it…. What I like the most about La Crema Chardonnay is while it has some soft fruit or flowery flavors, its buttery and smooth finish is what makes it interesting. I think it would go well salmon or any fish, but also with a steak. I would not necessarily just sip this one without food – it seems like it would be best with a little something to bring out its flavor. The grape is generally easy to grow and is highly resistant to vine diseases. It is not especially flavorful in and of itself, which means that a winemaker has a lot of control in a wine’s taste via the winemaking process (see next section). And in general, as a wine, Chardonnay is extremely popular, making it a relatively easy sell for winemakers. “A typical Chardonnay winemaker is more chemist than vitner.” (The Wine Avenger) That might be a harsh assessment, but when you read below, you may feel the same! Two things primarily affect the flavor of Chardonnay grapes when turning them into wine. (1) Malolactic Fermentation (yes – there will eventually be a wine word guide on Wino to Wine Know – this Wino can’t keep up!). According to my good friend, Wikipedia, “Malolactic fermentation (or sometimes malolactic conversion or MLF) is a process in winemaking where tart-tasting malic acid, naturally present in grape must, is converted to softer-tasting lactic acid.” So, now that we know that, we know that the wines that go through that fermentation process have a more buttery taste, and those that do not go through the fermentation process have a crisper appley taste. My guess is that the La Crema Chardonnay does indeed have some MLF happening (look at me already abbreviating my new favorite winemaking verbiage!). So what we’ve learned so far is that Chardonnay grapes are grown all over the world, and the taste of a Chardonnay wine is really more dependent on both the maloactic fermentation process and its barrel rather than the grape itself. I find this very interesting and feel that if I ever venture to make my own little barrel of wine, that perhaps I should start with Chardonnay! Woot! I feel like my Wino assessment was pretty close to the winemaker’s assessment! (Again, I write the Wino Assessment prior to my Wino research). Of course, the winemaker has a much better and expansive selection of words, but I think “buttery” is close to “butterscotch” when speaking about wine flavors, and “soft fruit” is similar enough to “flavors of yellow apple and orange adding lushness.”. Am I stretching too much?? As previously stated, Chardonnay is one of the most widely planted white wine grapes in the world. In the North America, it immensely popular in California, but is also grown in New York, Washington State, and Oregon. Canada also grows Chardonnay (Canadian wine?? Hmm… I smell a future blog post.) In Europe it is most popular in France. And in other regions of the world it can be found in Australia, New Zealand, and South America. Basically, if you’re seeking out some Chardonnay vines, just go to any wine country region of the world and you’re likely to find it. So La Crema, in this Wino’s book, is indeed a Divine Wine! Give it a try and let me know what you think!